The electrician finished his work and everything works as expected, finally. 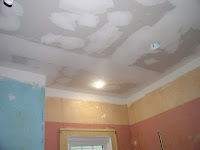 We have a new kitchen ceiling. It still needs priming and painting. 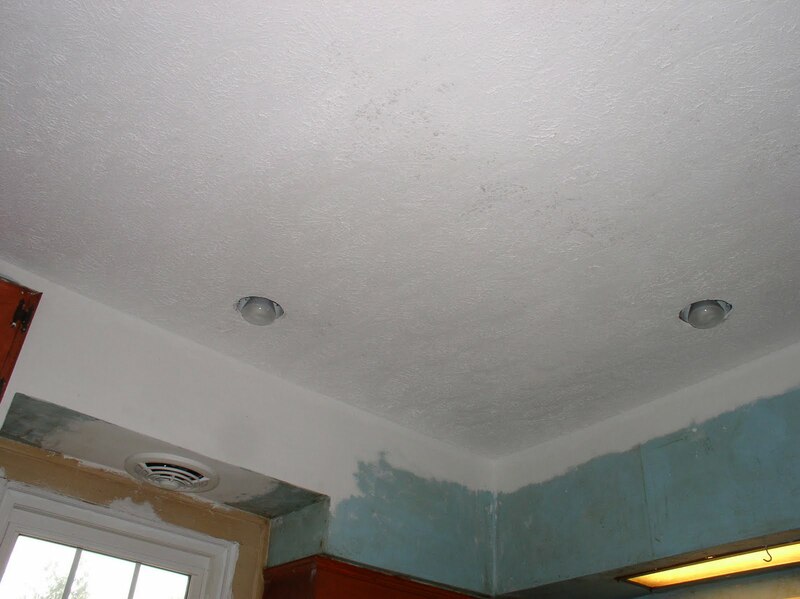 Since this picture, it was textured and a new fan was installed over the stove. The texture picture shows the other end of the kitchen. The man who did the texture work really seems to know what he is doing on ceilings. However, in other things, not so much. In helping install the fan, he stepped on the top of my stove bending the center and damaging the surface. Luckily our contractor could repair the bend. It took him a couple of hours to dis-assemble the stove top, straighten it, and put it together again, hours which were deducted from texture man's pay. It's not a new stove and chances of getting a new top were slim. We're relatively happy with the repair. At least everything still works. 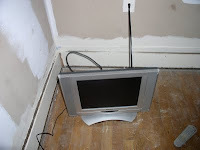 DH and DD have been running tv cable through the walls of all rooms were we will want a tv. this, of course, has resulted in language I didn't want to hear, multiple trips to Radio Shack for supplies, new tools, and finally, success. We will have connections like this in 3 bedrooms, kitchen, living room, and basement. We don't have that many tvs, but the thinking is to do it now, before insulating the house. Ideally, all wires should be in place before we get insulation blown into the walls, making the house snug and cozy for winter. That is why the flurry of activity in electricity and tv cables. 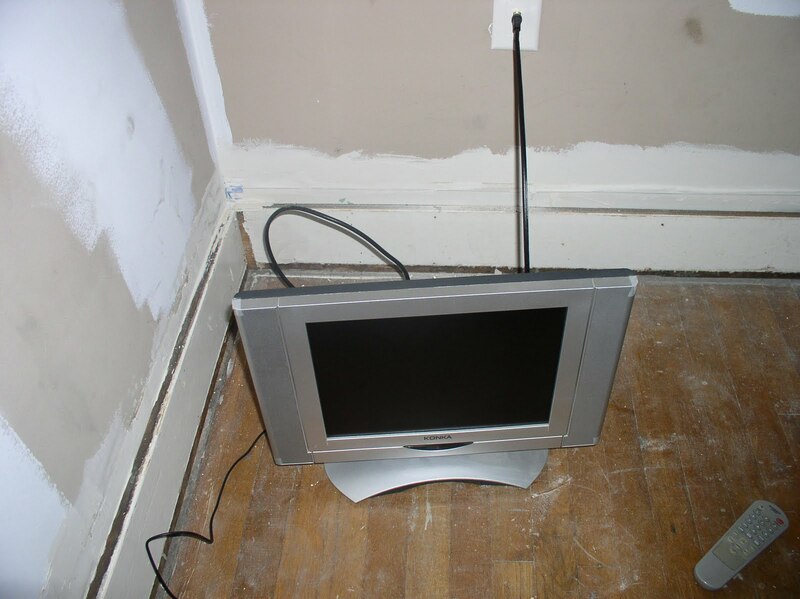 The electricity needed doing, the tv cable was more optional. Our neighbor insulated a couple of years ago, and cut his heating bill in half. We cut ours in half by installing new windows, now we'll cut it again. Next year we'll put siding on the house, and stop spending money like a drunken sailor. We expect it to pay for itself in about 5 years. I seem to have missed showing off the latest pairs of birthday socks. 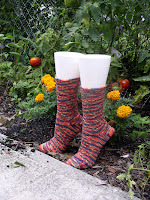 For my son-in-law with the large feet, I extended the yarn by adding color to the leg. I still need to write the pattern, but I have the charts for the leg done. The pattern will offer a number of options for the leg portion of the sock. This man really loves my socks, because they fit! 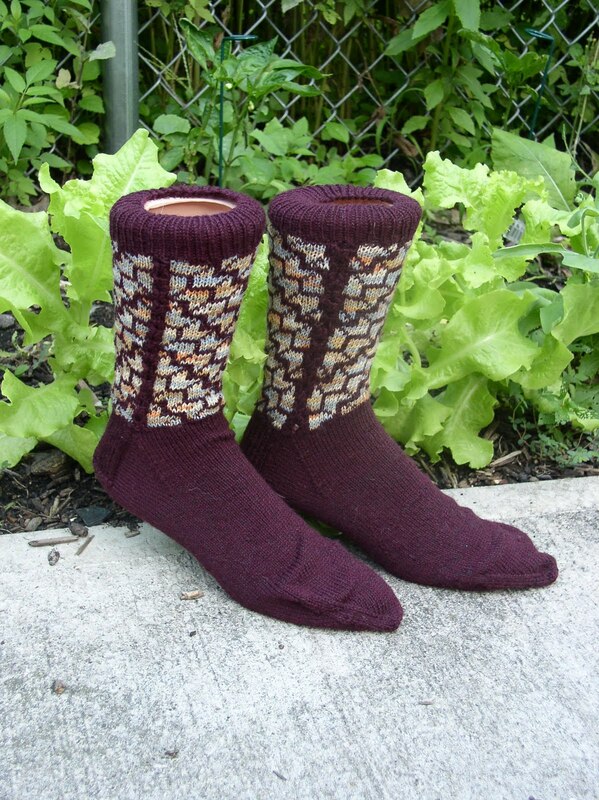 In addition, I knit a pair for DD the remodeler. I know I didn't show them there, because she reads the blog. Because of the yarn colors, I used a simple pattern. It still doesn't show up well in the photos. 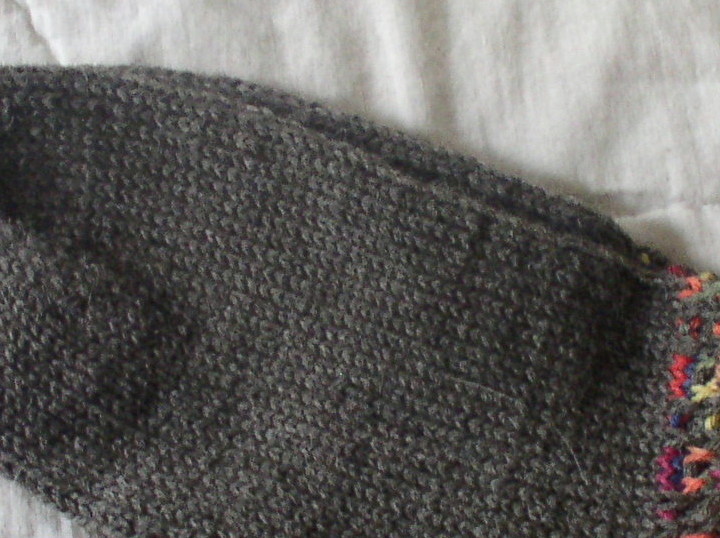 The "in progress" photo shows the pattern, k2, p2 ribbing offset every 6 rows. Unfortunately, this doesn't show well in the later photos. This is the daughter who shrunk a couple of things earlier this year. The socks were not supposed to shrink, the wrist warmers were wool, but she forgot. I won't be using that yarn for socks again. All gift socks are now being knit with bullet proof yarn. 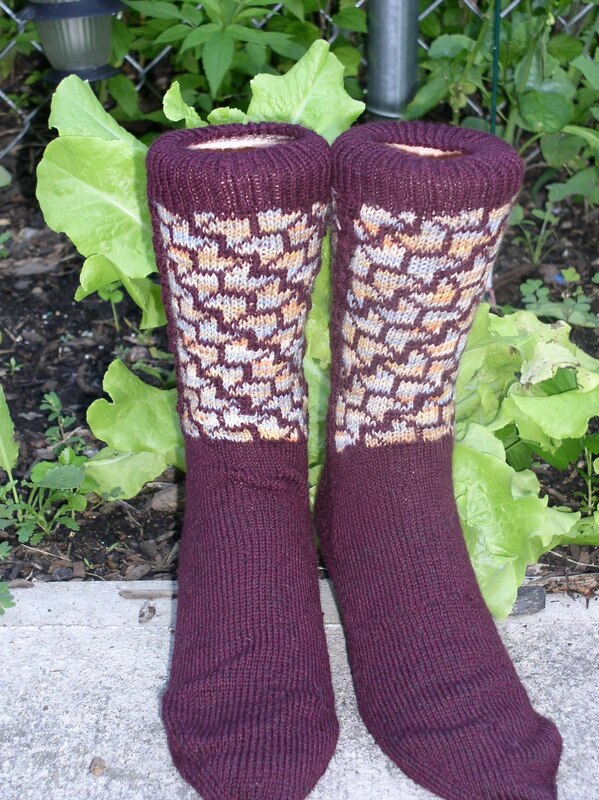 The brown socks are Patons Kroy 4 ply with Regia contrast. The other socks are Grundl Four Seasons. I seem to need 25% nylon for gift socks. Even the careful people occasionally find socks coming out of their dryer. Maybe my sister will get some fancier yarn. I know she hangs sock to dry, and is a sock knitter. The tree bark sweater is up to the "armholes" in back, there being no armholes, just a square piece. I slowed down on it because I realized that another birthday looms, and the recipient is back in town. She took off for parts unknown (kids!!) but is now back. 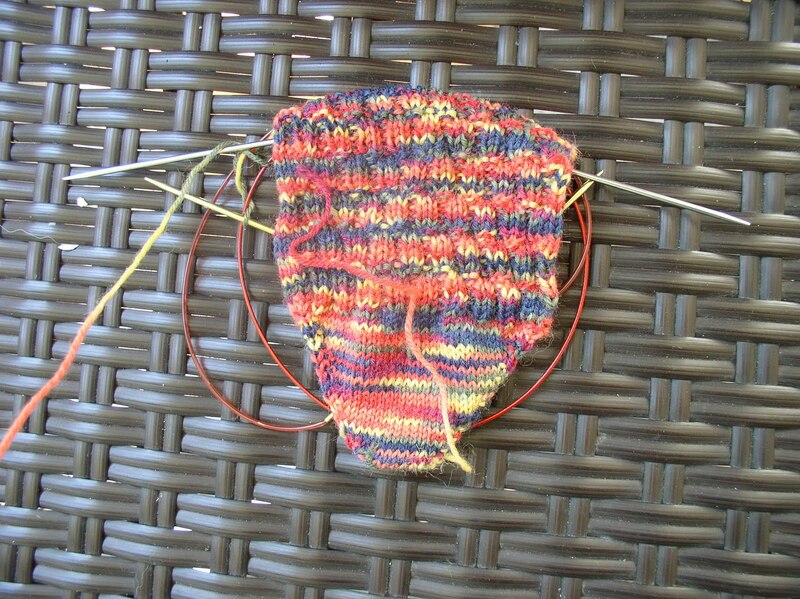 The socks would be finished now, but I knit the first foot on leg needles, which were too large. Reknitting commences within minutes. Luckily these are the smallest adult feet in the family. 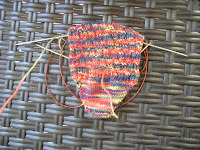 Main color is Patons Kroy 4 ply, contrast is left from above socks. There was more dark color in the variegated yarn than I expected, so not the best contrast. 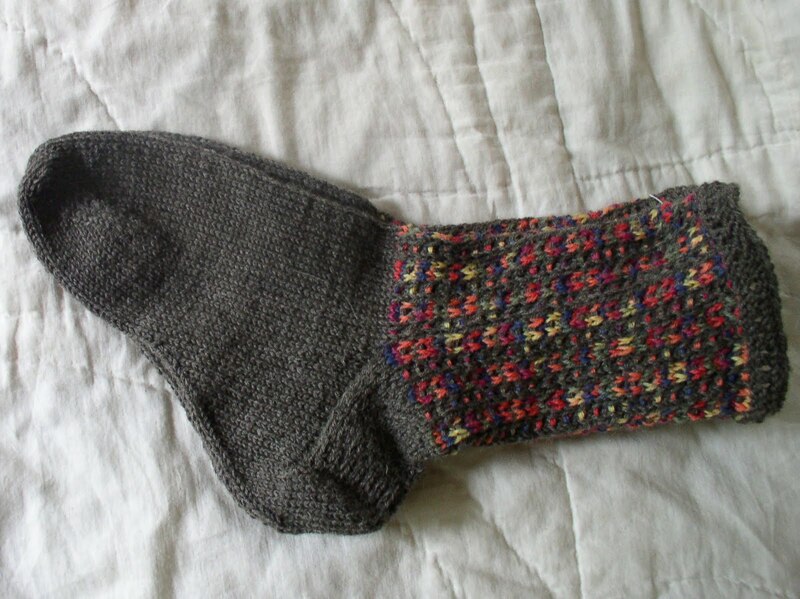 I'll choose better colors and knit another pair before I release the pattern. 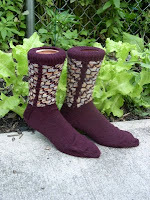 I will write patterns for both pairs of socks, but will delay release until I have samples that better show the stitch patterns. This may be the winter for reknitting patterns that have been on hold. I also have a number of them where the original socks were black, again not a good choice for photos.